BACKGROUND AND PURPOSE: Patients with intracranial aneurysms are at risk for future development of new aneurysms and growth of additional untreated aneurysms. Because in previous long-term studies duration of follow-up varied widely, the time interval after which screening could be effective remains largely unknown. The purpose of this study was to assess the incidence of de novo aneurysm formation and the growth of additional untreated aneurysms in patients with coiled aneurysms followed up with MR angiography (MRA) after a fixed period of 5 years. MATERIALS AND METHODS: In 65 patients with coiled intracranial aneurysms, high-resolution 3T MRA was performed 5.1 ± 0.2 years after coiling. MRA follow-up imaging was compared with MRA or CT angiography at the time of coiling. Additional aneurysms detected at MRA follow-up were classified as unchanged, grown, de novo, or incomparable with previous imaging. RESULTS: In 13 of 65 patients (20%), 24 additional aneurysms were found. Four aneurysms were incomparable with previous imaging and 2 of these were clipped. Of the remaining 20 additional aneurysms, 1 was de novo, 1 had grown slightly, and 18 were unchanged. The incidence of de novo aneurysm formation after 5 years was 1.54% (95% confidence interval, 0.01–9.0%). For additional aneurysms known at the time of initial coiling and for the 1 de novo aneurysm, no treatment was indicated. CONCLUSIONS: MRA screening 5 years after coiling for detection of de novo aneurysms and growth of additional untreated aneurysms has a low yield in terms of finding aneurysms that need to be treated. In a substantial proportion of patients presenting with an intracranial aneurysm, small additional aneurysms are found.1 Some of these additional aneurysms may be surgically or endovascularly treated in the same or in a repeat procedure, but many will be left untreated because of small size, unfavorable aneurysm geometry, or location remote from the target aneurysm. Apart from this, patients with treated intracranial aneurysms are at risk for developing new aneurysms with time.2-6 Little is known about the frequency of de novo aneurysm formation and the pace of growth of small additional aneurysms that were left untreated. In particular, the time period after which screening for these events could be effective is unknown.7-9 In a recent study of 610 patients with ruptured aneurysms that were clipped, after 2–18 years of follow-up, de novo aneurysms had developed in 3% of patients and 25% of untreated additional aneurysms had enlarged.2 Because follow-up intervals varied widely, the time of first development or growth remained obscure. The purpose of the current study was to assess the incidence of de novo aneurysm formation and determine the natural history of additional untreated aneurysms in 65 patients with coiled intracranial aneurysms after a fixed follow-up period of 5 years. This study was approved by the institutional review boards of the 3 participating hospitals in the Netherlands (St. Elisabeth Ziekenhuis Tilburg, Academisch Medisch Centrum Amsterdam, and Universitair Medisch Centrum Utrecht) and written informed patient consent was obtained. From the databases of the 3 centers, we selected all patients with a ruptured or unruptured aneurysm coiled in the period from January 1, 1995, to December 31, 2002, and with adequate aneurysm occlusion (complete occlusion or small neck remnant) at 6-month angiographic follow-up. Further inclusion criteria were current age between 18 and 70 years, independent functional state, and no contraindication for 3T MR imaging. All aneurysms were treated with Guglielmi detachable coils (Boston Scientific, Fremont, Calif). We contacted the general practitioner of all eligible patients to find out if the patient was still alive. If the patients had died, we asked for the date and the cause of death. If a patient had died in a hospital or other facility, we reviewed the medical records. The patients who were still alive received a letter with background information and an invitation to participate in this MR imaging follow-up study. Patients who consented were invited for MR imaging. A written report of the MR imaging findings was sent to the general practitioner, and patients were informed about results by telephone or at the outpatient clinic. The long-term follow-up MR imaging data were analyzed for assessment of long-term stability of coiled intracranial aneurysms with adequate occlusion at 6 months.10 For the purpose of this study, we selected those patients with an MR angiography (MRA) follow-up of 5 years. MR and MRA imaging (axial source images, maximum intensity projections, and volume rendered images) were evaluated and compared with previous imaging studies in 2 institutions by 2 experienced neuroradiologists (M.E.S. and C.B.L.M.M. or B.K.V. and G.A.P.d.K.) independently. Discrepancies were resolved in consensus. Location and size of additional aneurysms were recorded and compared with MRA or CT angiography (CTA) at the time of coiling. Subsequently, these aneurysms were classified as unchanged, grown, de novo, or incomparable with previous imaging. Clinical implication in terms of treatment advice and change of follow-up imaging policy of these 5-year-follow-up findings was assessed. Between January 1, 1995, and December 31, 2002, 661 aneurysms in 612 patients were coiled in the 3 participating centers (Tilburg, 483 [76%]; Utrecht, 105 [16%]; and Amsterdam, 24 [8%]). Of 612 patients, 457 with 497 aneurysms had 6-month follow-up angiography, and 316 aneurysms in 297 patients were adequately occluded at this first angiographic follow-up (Fig 1). Of 297 eligible patients with 316 aneurysms, 84 were excluded for the following reasons: dependent functional state in 5, age older than 70 years in 39, 3T MR imaging contraindication in 27 (clipped additional aneurysms in 18, claustrophobia in 4, and a pacemaker in 5), unrelated death in 13 (cancer in 6, cardiovascular disease in 3, old age in 1, and unknown but unlikely subarachnoid hemorrhage [SAH] in 3). Seventy-three patients could not be traced, but many of these patients had previous clinical or angiographic follow-up beyond the 6-month interval. The remaining 140 patients were invited to participate in the study, of whom 36 declined. Thus, 104 patients (Tilburg, 74 [71%]; Utrecht, 25 [24%]; and Amsterdam, 5 [5%]) with 111 aneurysms were followed up with MRA. Flowchart of the total cohort and included patients. Of the total 104 patients, 39 patients with 46 aneurysms had a follow-up interval of >5 years. Sixty-five patients with 65 coiled aneurysms had a consistent MRA follow-up of 5.1 ± 0.2 years after coiling. These patients are the subject of this study. There were 46 women and 19 men with a mean age of 54 years (39–70 years). Of 65 coiled aneurysms, 54 were ruptured and 11, unruptured. In 13 of 65 patients (20.0%), 24 additional aneurysms were found. 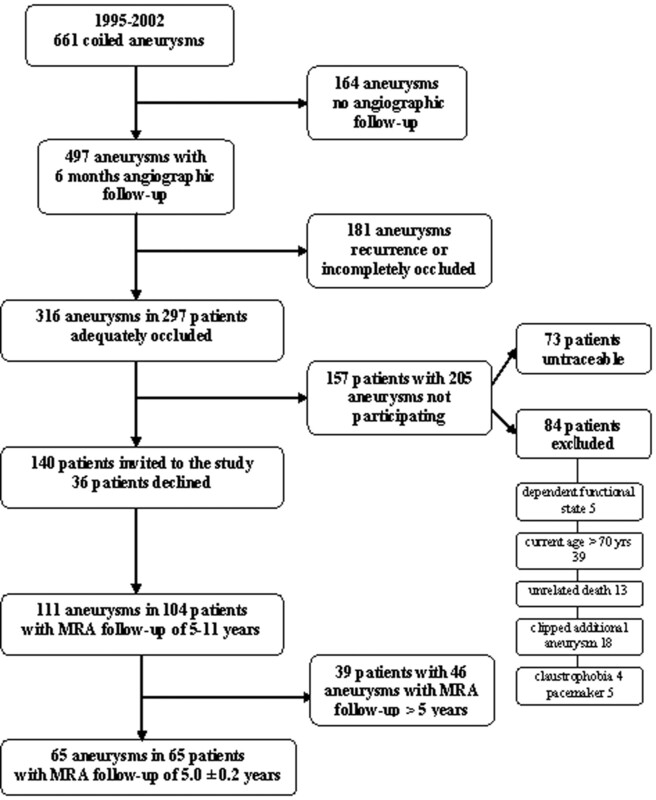 Characteristics of patients with additional aneurysms on 5-year MRA follow-up are displayed in the Table. Eight patients had 1 additional aneurysm, 2 patients had 2, and 3 patients had ≥3 additional aneurysms. In 3 of 24 additional aneurysms, no previous imaging was available, and these aneurysms were classified as incomparable. In another 1-mm choroidal artery aneurysm, the projections of the initial carotid artery angiogram did not allow verification of its presence or absence, and this aneurysm was also classified as incomparable. The remaining 20 additional aneurysms could be compared with previous imaging: 18 of 20 were classified as unchanged; 1, as having grown; and 1, as de novo. The 18 unchanged additional aneurysms were present in 11 patients. Sizes ranged from 1 to 6 mm; an example is provided in Fig 2. A 54-year-old woman with 3 untreated additional aneurysms unchanged after 5 years. A and B, Right internal carotid angiogram (A) and vertebral angiogram (B) show additional aneurysms on the carotid cavernous sinus, middle cerebral artery, and superior cerebellar artery (arrows). 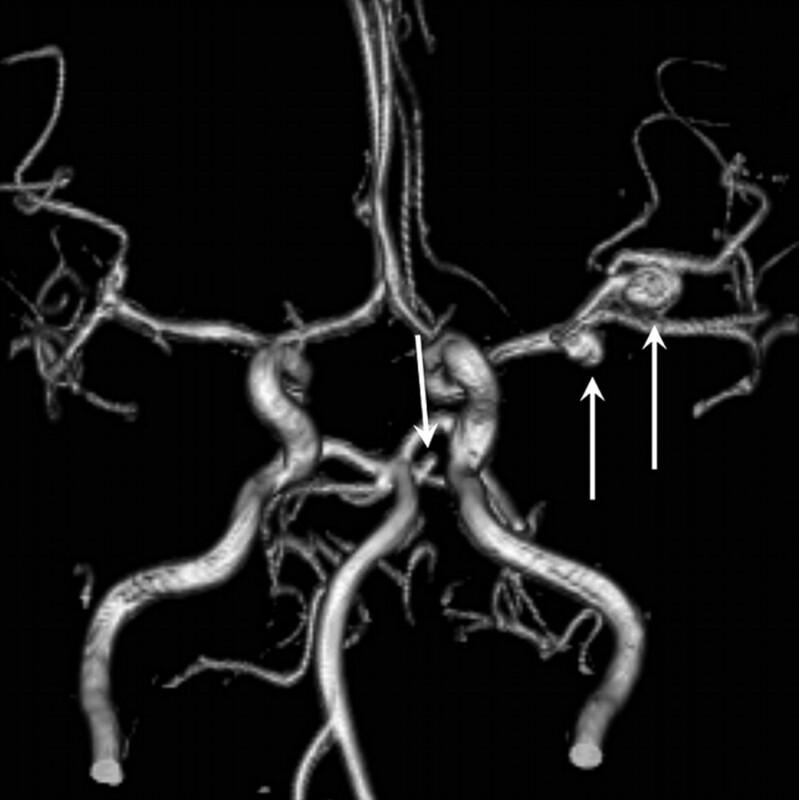 C, MRA after 5 years demonstrates unchanged size of all 3 aneurysms (arrows). The only additional aneurysm that had grown was a pericallosal artery aneurysm in a patient with 5 additional aneurysms that increased from 1.5 to 2.5 mm in 5 years (Fig 3). The only definite de novo aneurysm was a 3-mm middle cerebral artery aneurysm (Fig 4). A 25-year-old woman with multiple additional untreated aneurysms. A, Initial lateral view of an internal carotid angiogram shows a 1.5-mm pericallosal artery aneurysm. B, Five-year follow-up MRA reveals growth to 2.5 mm. C, Angiogram confirms MRA findings. A 56-year-old woman with a de novo 3-mm middle cerebral artery aneurysm. A, Initial angiogram of the middle cerebral artery. B, MRA after 5 years shows 3-mm de novo aneurysm (arrow). The 4 additional aneurysms that could not be compared with previous imaging were present in 2 patients. One patient had the 1-mm choroidal artery aneurysm that could not be verified on the available projections of the carotid angiogram. The other patient had 4 additional aneurysms, 3 of which were not imaged before. The location and size of these 3 aneurysms were the following: 1 on the superior cerebellar artery (3 mm) and 2 on the left middle cerebral artery (3 and 6 mm) (Fig 5). 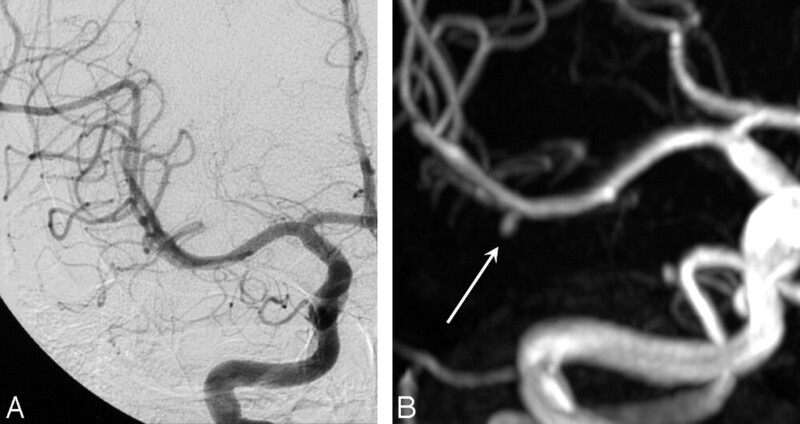 Five-year MRA follow-up in a 42-year-old woman with a coiled right middle cerebral artery aneurysm demonstrates 2 left middle cerebral artery aneurysms and a superior cerebellar artery aneurysm (arrows) without available previous imaging. The 2 middle cerebral artery aneurysms were clipped. Of 24 additional aneurysms, 2 left middle cerebral aneurysms in 1 patient classified as incomparable with previous imaging were clipped without complications. For the remaining 22 additional aneurysms, treatment was considered not indicated and no specific follow-up policy was advised. Thus, for additional aneurysms that were known at the time of initial coiling and for the 1 de novo aneurysm, no treatment was needed. MRA 5 years after coiling of an intracranial aneurysm to detect de novo aneurysms and the growth of additional untreated aneurysms has a low yield: In 65 patients, only 1 small de novo aneurysm was detected and 1 of 20 untreated additional aneurysms showed slight enlargement. For none of these aneurysms was treatment indicated, and no specific follow-up policy was advised. In some patients, both angiography at the time of coiling and short-term follow-up angiography were incomplete. As a consequence, on follow-up MRA, 4 additional aneurysms (in 2 patients) were detected without previous angiograms. Two of these aneurysms in 1 patient were clipped. This event emphasizes the importance of complete imaging of cerebral vessels when angiography is used as the only diagnostic tool. Although our study was retrospective with a limited number of patients, to our knowledge, it is the first follow-up study with a fixed interval of 5 years. Our 3T MRA technique without intravenous contrast enhancement provides high-resolution images of the intracranial vessels without artifacts of inserted coils.9 Therefore, it is unlikely that aneurysms were missed. The incidence of de novo aneurysm formation after 5 years in this study was 1.5%. This figure is in concordance with a previous CTA follow-up study on 610 patients with clipped aneurysms with a variable follow-up of 2–18 years2: in the first 5 years after SAH a de novo aneurysm developed in 1 of 120 patients (0.8%). Further, in our study, 1 of 20 additional aneurysms (5%) had enlarged 1 mm after 5 years. In the cited CTA follow-up study,2 in the first 5 years after SAH, 4 of 18 aneurysms (22%) had enlarged with a rate of 0.12–1.3 mm per year. These figures are only valid for patients who survived at least 5 years after treatment of an aneurysm without recurrent SAH. The risk of recurrent SAH after treatment was assessed in a follow-up study after clipping of ruptured aneurysms.11 In this study the incidence rate of recurrent SAH in the first 10 years after clipping was 286 per 100,000, whereas in the general population, this figure is 9–10 per 100,000. However, during the first 33 months, no recurrent SAH was observed from de novo or regrowth aneurysms. In another study,7 short-term (1–2 years) CTA follow-up of small aneurysms detected at screening in patients with a history of SAH or with familial aneurysms did not eliminate the risk of recurrent SAH: Two of 93 patients had a recurrent SAH, 1 from the clipped aneurysm and 1 from a new dissecting aneurysm. In that study, in 3 of 93 patients, the small aneurysm detected at screening had enlarged slightly. Although current available data suggest a low yield of MRA screening at 5 years for patients with treated aneurysms in general,15 this may be different for subgroups of patients with increased risk, such as young patients with multiple aneurysms, patients with a positive family history, or patients with proved growth of additional aneurysms. Currently, not enough data are available and larger follow-up studies, preferably with fixed follow-up intervals, are needed to identify subgroups that might benefit from screening at 5 years. MRA screening 5 years after coiling for the detection of de novo aneurysms and for growth of additional untreated aneurysms has a low yield in terms of finding aneurysms that need to be treated. After 5-year follow-up MRA in this group of 65 patients with coiled intracranial aneurysms, we found 1 small de novo aneurysm and 1 small additional aneurysm that showed a minimal growth. Treatment for these aneurysms was not indicated. This work was supported by grants from the Dutch Brain Foundation; the Nuts Ohra Foundation; and Boston Scientific, Maastricht, the Netherlands. Accepted after revision September 8, 2008.